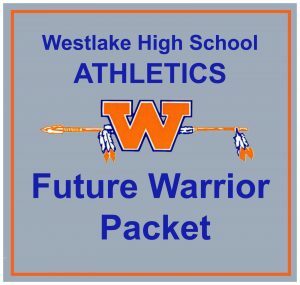 If you will be a NEW student at WHS next year and you are interested in joining one or more of the 27 sports teams at Westlake High School, check out the Future Warrior Packet below to learn what sports we offer and what is required to be a WHS student-athlete. Also, be sure to fill out the WHS Sport Interest Form to let the Athletics Department and WHS Coaches know which sports you are interested in playing here at WHS. When you submit the form, you will be added to your sports’ mailing lists and will receive emails regarding upcoming camps, tryouts, and other events. Per CIF rules, correspondence between coaches and future athletes may not begin until May 1st for the following school year, but you may receive informational emails from the athletic department before then. Your information will not be shared with anyone outside of Westlake High School.